Cruentus Fate has lived a comfortable life as a Royal within the city of Macellarius in the kingdom of Nex in the empire of Mu, but something seems to be amiss in her life. While she can remember growing up within the palace with her brother Abyssus and being adored by her father King Neco, neither she nor her brother can remember when they actually arrived at the palace to live. A cruel twist of fate separates her from her brother as King Neco sells Fate to a brothel where its owner, Fortuna, raises her as her own daughter. Fortuna teaches Fate about the instability of the Empire and of an impending war between the Council and the Rebellion Upon receiving knowledge of the Empire, Fate is determined to restore balance to the Empire once more, but with each secret she unveils on her journey, the more she discovers that her life has been a lie and the darker the world and her past become. Wow, what a way to begin a new fantasy series. Co-authors Isu Yin and Fae Yang have made quite the impression with their impressive first book of their Grims’ Truth Series published by Evolved Publishing: Rota Fortunae. It has elements fantasy fans would expect to find without the clichés readers normally come across. True, magic is perhaps the most dominate element within this fantasy, but what makes this story so endearing is the fact that the authors’ magic is written about in a rather realistic fashion. Yin and Yang deserve much credit for not only have they seamlessly written a book that will make readers forget that there are two authors, but they have also created an intricate new world unlike any that has been read in quite some time. Layer upon layer of plots have been strategized with many twists that will take readers by surprise with each turn of the page. With how complex the story becomes, however, it could take a bit for the reader to get into and, for a majority of the book, the story is told so quickly readers may even become a bit lost. And descriptive detail is unfortunately not as present as would be favorable, leaving visuals of the world up to the imagination of the readers more so than other stories. These do not take away from the story, though, and it is to be expected that parts which leave readers questioning will be explained in later books. For such an intricate world, in-depth characters are a given and Yin and Yang have delivered them. There are quite a few characters introduced within just the first book of Grims’ Truth and many do not get as much time in the spotlight, but the main characters focused upon in Rota Fortunae most certainly shine, especially Fate and Hero. Fate may not be so strong physically, but she is a force to be reckoned with mentally and spiritually. She does not give up easily and will do whatever it takes to help and protect those she loves. Hero is on the brink of being a hopeless case, unwilling to trust anyone and believing he must endure the hardships he faces in life alone. Once he meets Fate, he has beautiful character development and once the two are together, their relationship turns into one readers will fall in love with. An element all fantasy fans most likely love about this particular genre are the stories within the stories: stories that speak of prophecies, of ancient legends, of historical battles, of world-changing journeys. All of these stories and more can be found in fantasy and Yin and Yang have created stories of their own: stories of the beginning of the Empire, stories of the oldest races of beings, stories of beliefs and what are thought to be myths. Many stories are told throughout Rota Fortunae and help to explain many points of the complex plot. What is most helpful for readers is found at the end of the book for Yin and Yang have added a Rota Fortunae Reference Guide to explain all folklore, characters, terminology, races, and more that strictly pertain to this first book. 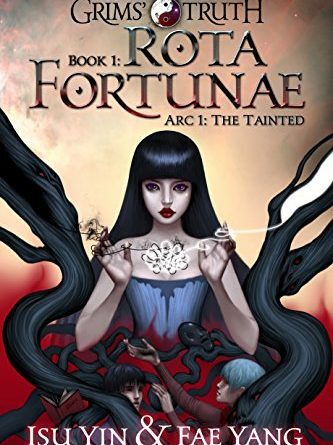 Rota Fortunae introduces an impressive new fantasy world that will draw readers in and leave them feeling fascinated and curious upon completion, making them wish to pick up Conundrum, the next in the Grims’ Truth series. Readers will forget that the story they are reading was written by two individuals as Yin and Yang make an excellent writing team. They have created a complex world that will both confuse and intrigue readers as the in-depth characters take them along on their journey. The story does move quickly and there are times when readers may wish for it to slow down to either take in where the characters are presently or what is happening in the plot at a particular moment, but these components in no way take away from the reading experience as a whole. 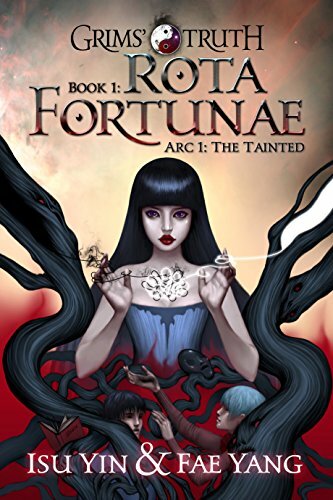 Readers should also note that upon reading Grims’ Truth Book 1: Rota Fortunae – Arc 1: The Tainted, they will become part of a 60 plus book series that may very well be the longest fantasy series ever published. With three books of the series already published and two more scheduled for release by the end of this year, Yin and Yang’s Grims’ Truth will most likely turn into THE series to watch out for.